Forrester recently released a book ‘ Outside In : The Power of Putting Customers at the Center of Your Business’. The book highlights that customer experience is the greatest untapped source of cost savings and increased revenue today. Additionally customer experience strategies can drive differentiating activities and processes at top companies. Forrester also discuss how to design and measure enterprise-wide customer experience. As mobile and social are quickly becoming new channels for customer acquisition, engagement and service, many brands are looking to social and digital channels as a means to better understand customer interactions with the brand across multiple channels and touch points. Also as the use of mobile and social channels increases exponentially, it is becoming critical that brands are able to create a 360-degree customer view by aggregating data from each one of these interactive channels. Without drawing from all touch-points, brands fail to have a holistic understanding of the consumer and run the risk of presenting disjointed messaging to the consumer as they visit the brand from a diverse number of channels. How can we help our customers service their customers? How can we increase customer engagement and loyalty with the brand?How do we ensure that we are solving the right problem? When is Customer Experience the Right Approach? If the answer to the questions below is ‘NO’ then customer experience is the right approach to drive business priorities – are you able to pinpoint the customer’s painpoints? Are you addressing the pain they feel? Does everyone in the organization have a clear picture of the processes customers go through when interacting with the organization? Are we Solving the Right Problem? : A common vision and vocabulary within an organization of the ‘customer’ and ‘customer interactions’, across all channels is key to solving the ‘right’ problem. It is worth noting that by overlaying the customer journey maps with specific business goals such as improving productivity and efficiency of the sales force or increasing customer engagement and loyalty, we can not only identify ‘new’ problems but also define ‘new’ solutions to old problems. Have we Identified the Right Opportunities? : Identify the ‘right’ opportunities by mapping customer interactions across channels and touchpoints and identifying highlights and lowlights by focusing on complex interdependencies between people, process and tools. Have we Prioritized the Opportunities? : Once the opportunities across all channels have been identified, shared and verified by internal business stakeholders, they need to be collaboratively prioritized based on factors such as business impact and risk weighed against cost and effort. Ensure Executive Sponsorship: The stakeholders selected as part of the steering committee typically span lines of businesses (LOB). Since journey maps visualize ‘end-to-end’ interactions, multiple departments and stakeholders get involved in the discovery process hence leadership commitment is crucial to drive decision making across LOBs and for the success of a customer experience engagement. Select Key Customer Segments: To obtain a good cross-section of interviewees it is critical to identify customer variability across several dimensions. As an example, for the sales force variability could be based on region, tenure, role and the type of customer the sales person services. It is also important to create a 360 degree view of the customer by creating a touchpoint mapand interviewing all teams within the organization that the customer interacts with. 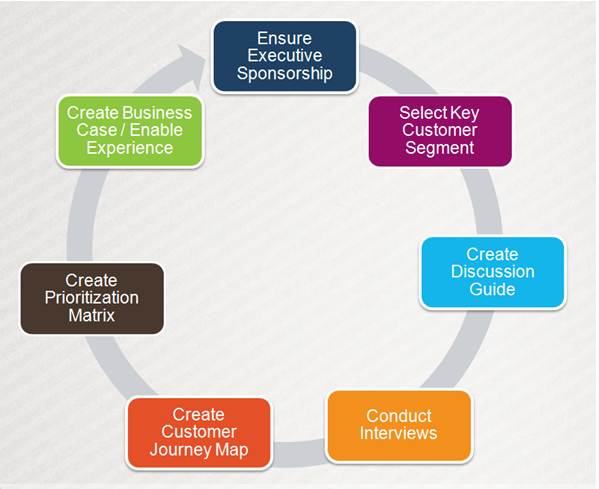 Create Discussion Guide: The discussion guide should be tailored to the audience and aligned with business objectives. Conduct Interviews: drill-down to the root cause, discuss what-if scenarios, best practices and current initiatives within the organization. Identify New ‘Niche’ Customer Segments – Just because people share some similar characteristics such as age and gender (e.g. female in the age group 35 – 45) does not imply that they share the same passions and interests. Understanding customer behavior, motivators and interactions will help to deeply engage with them and identify needs of the ‘niche’ customer segments which can drive development of personalized experiences which motivate customers to change behaviors. Deliver Targeted, Personalized Content and Advertising – Moving beyond ‘likes’ and ‘follows’ – integrating back-end data sources, structured and unstructured data to create a 360 degree of the customer can provide a wealth of information for improving customer understanding and targeting them with personalized content. Increase Customer Loyalty – Customer loyalty and satisfaction can be improved by creating a 360 degree view of the customer and gaining deeper insights into existing customer segments as well as discovering new customer segments by developing a multi-channel strategy and aggregating data across mobile, social and digital channels. The key to building applications which drive business growth and improve customer engagement lies in identifying a new breed of business leaders who understand the importance of customer experience and evaluating organizational readiness to deal with the impact of digital innovation. Companies can truly understand the ‘empowered’ customer and build applications which transform the business by creating a common view of the customer (customer segments) across the organization by mastering behavioral, business and emotional context. Behavioral context measures engagement and propensity to buy, business context identifies business drivers and how to generate customer value differentiation and finally emotional context measures sentiment, customer preference and perceived value.